It's not every day that an industry game changer comes along to shake things up. 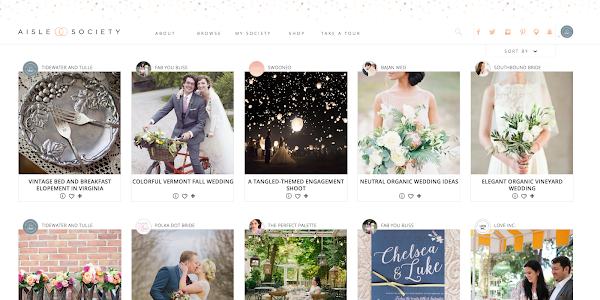 And for the past 9 months, 30+ wedding blog editors from around the world have been working to do just that. To make the wedding world a better place, to hold the bar high when it comes to online publication, to embrace industry diversity, to celebrate the creativity of all wedding professionals worldwide, to challenge the way media is digitally consumed, and to bring together some of the best wedding blog editors that the internet has ever known. It's with super great excitement that we introduce... Aisle Society! Now what the heck is it? Today, I'm sharing why Tidewater and Tulle is a founding Aisle Society blogger and the top 4 reasons why wedding lovers everywhere need to be on Aisle Society! 1. Search for exactly what you what, not what a website thinks you want. No photo hot mess guessing or algorithm shenanigans here! Want to get ideas for a rustic purple and green wedding? Done. With the very robust and comprehensive search capabilities on Aisle Society, you can fine-tune all those attributes separately or all together: rustic, purple, green, real weddings. You're in charge here on Aisle Society! 2. Dedicated and professional wedding business press portfolio pages and lead generation... for free! We love wedding pros. We believe that publication is very much a mutually beneficial relationship; all of us can't exist without the other. To put that belief into existence, Aisle Society not only rounds up your published features from Aisle Society network blogs, but also allows pros to receive leads from potential clients. Consider it a little indirect thank you for supporting us through your submissions and advertising partnerships with our respective blogs! 3. Never miss another feature again. Remember that time where you miss everything because your newsfeeds either don't show it to you or it's just a crazy busy day? I know that's definitely pretty much my life, and it really stinks when you actually want to know what's going on, especially because you want to support your wedding friends or just get inspired. Never again, folks! You can follow specific attributes and see them populate automatically in your customized Society. For me, I want to make sure I always see what's happening in Virginia, so in the beginning, I clicked the plus sign (+) next to "Virginia" and now I always see the Virginia features that my fellow Aisle Society editors have added. I can go to My Society at any time I have a moment to see these features. Organization accomplished. 4. Know where a favorite detail came from or who did it. Every time. 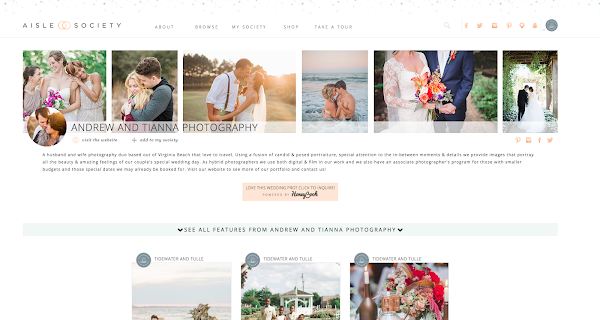 From day one since Tidewater and Tulle launched in December 2013, it's been no secret that I'm especially nutty about complete crediting on our features and our social channels, especially since I started in the industry as a wedding photographer back in the day. And when like-minded editors come together, you can expect nothing less. Weddings are teamwork, and online publication should always reflect that. 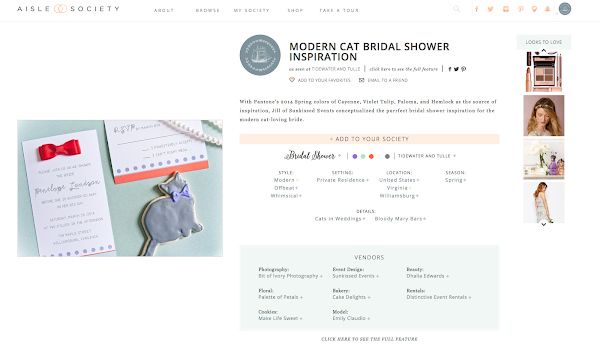 On Aisle Society, full vendor credits (and source credits) are always given on the website and social channels. Aisle Society boldly makes it known where we stand on editorial integrity. No gray area here; just high standards! Did I get you jazzed up yet? Are you excited as I am?! Now it's your turn! 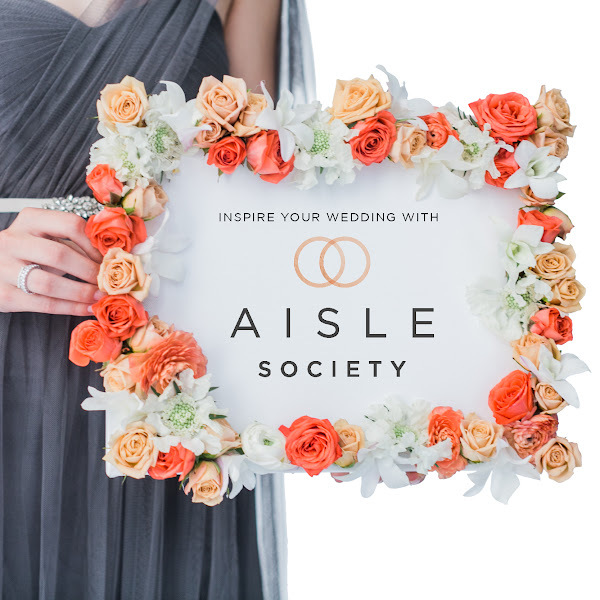 Head over to Aisle Society to sign up for your own Society, discover your own kind of wedding, and be part of this game-changing community of publishers, pros, brides, grooms, wedding parties, and more from all over this beautiful Earth of ours. 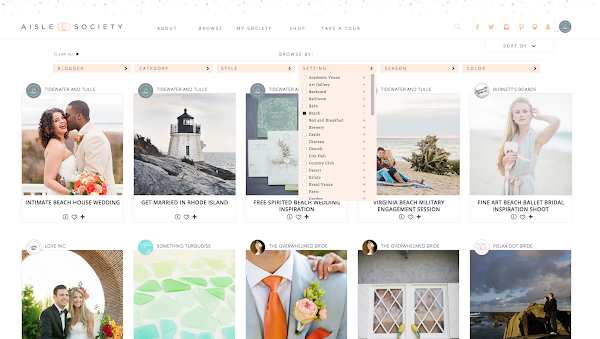 And of course, don't forget to follow Tidewater and Tulle on there!